Despite the high winds over the last few days and a flurry of sleet last night, the daffodils are still standing. Such hardy things, daffodils generate blots of yellow about the gardens and verges and nearly everyone comments on them. I cannot imagine that there is a single person who does not like seeing daffodils each spring. I am not keen on the colour yellow but I make an exception with daffodils. I prefer Tête-à-tête as the short stems tend not to collapse in windy weather, important for this garden which is rather exposed. Rip van winkle is another favourite thanks to his shredded punky appearance. 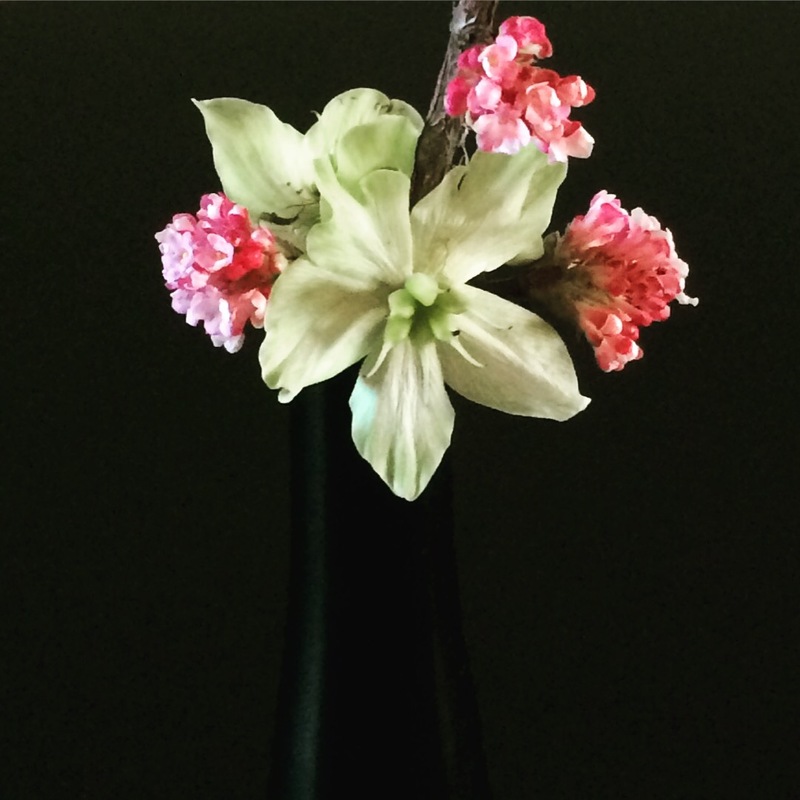 This year van winkle and Tête-à-tête are joined by a mixed selection of scented daffodils from the Scilly isles. My friend Kay kindly carried a small box of bulbs home to give me an early birthday present. Even more generous considering the hand luggage only rules from the orange aircraft carrier. 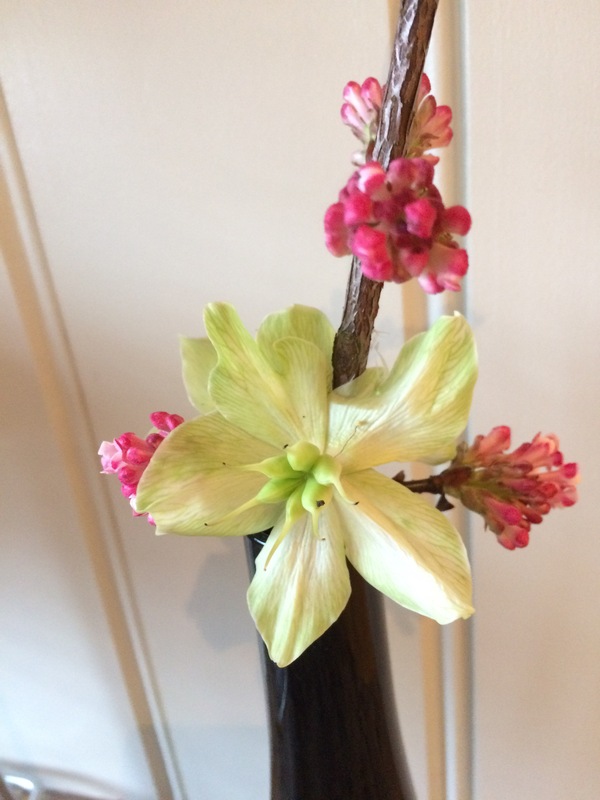 This is the first one showing, it has six tiny yellow flowers with orange centres on one stem and is highly scented with that heavenly sweet daffodil perfume. I believe it to be Grand Soleil d’Or. Viburnum bodnantense Dawn is still flowering its highly scented pale pink Pom poms and now is joined by the first of the Grape Hyacinths. They are in a 500ml flask which holds their tiny beauty carefully. By contrast I have pinched three tiny violas from my bath tub container. Tiny violas too have a sweet perfume detectable at close quarters. Their papal purple colours and velvet texture have been damaged by the weather even so I think their beauty is exquisite. What do you have to share with us and Cathy this Monday. I’ll bet there is something. Wishing you all a good week ,wherever you are. D.
Ding dong the snow has gone and Monday started out with so much promise, mild and bright. Alas the rain came later and my garden which was already resembling swill is now ankle-deep in water in places. Trying not to dwell on the damage that this will be doing to some plants, I have collected a rare few flowers to show you and readers of Cathys blog today. Do try to pop over to see her lovely blog, you will be amazed with what you see in some other vases. Less ‘in a vase’, rather more ‘set out to dry’. The forecast for the next few days, in my neck of the woods at least, is for rain and highs of 8 or 9 degrees, positively balmy after the last few days. Hoping you have a good week. D.
Last Monday I shared memories of Summer which some of you may have looked at and thought ‘yuck’, they were rather brown. With that in mind I cut some Viburnum and a Hellebore at the same time. 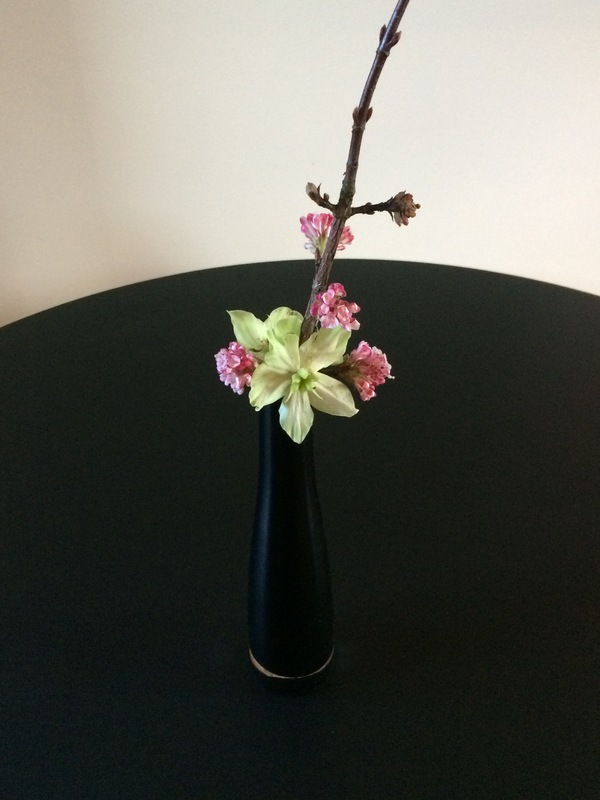 The Viburnum was in bud in the garden but tightly closed. ‘Ah ha’ I thought ( I did really think that exact expression), this could be good for next Monday. 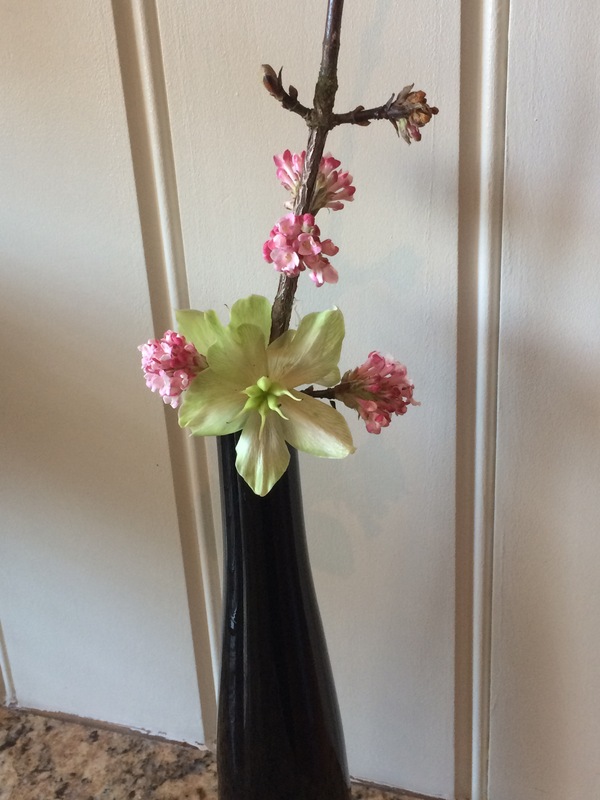 As hoped, the buds have opened and are now filling the room with their rather overly sweet scent. This is a first time appearance for the black glass stem vase. Part of a Christmas gift from Liz who had found it and a couple of others in a local charity shop. Perfect for my Mondays. So today I have a tiny little burst of colour thanks to Christmas rose, Helleborus niger and Viburnum bodnantense Dawn. Have a good week and let’s hope it stops raining. I am awash thanks to Thames Water, a burst water main, no mains drainage and heavy non stop rain today.